Sift both flours on work surface (preferably wooden). Scoop a well in the center and pour in slightly beaten eggs. 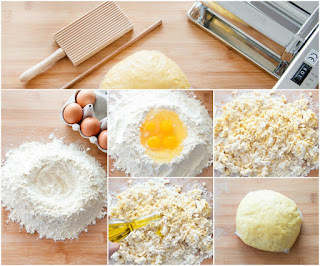 Add a pinch of salt and start mix all ingredients using a fork or a dough scraper until a crumbly dough forms. You can do this using your hands only if you’re OK getting s a little messy. Continue to knead the dough with your hands until the dough is smooth, elstic and no longer sticky. Wrap the dough in a plastic wrap and let rest for 15-30 minutes or even overnight (in a cool place or in the fridge). 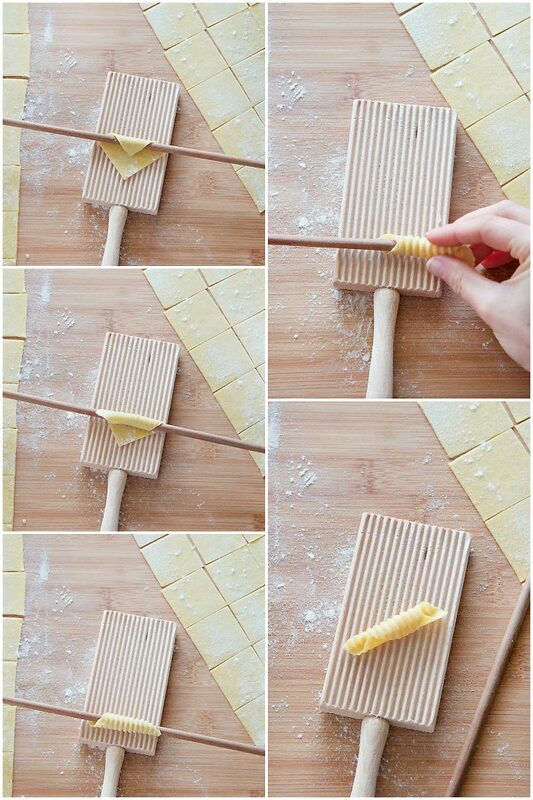 Cut off a piece of the dough and slightly flatten it with your fingers. 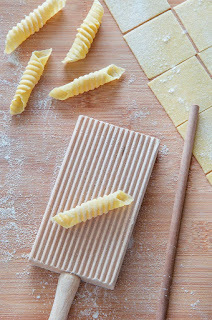 Using a rolling pin roll the dough into approx 1 millimeter thick sheet. Set machine on the widest setting (0) and pass the dough for the first time. Fold the dough in half and pass again on the same setting. Adjust to the next-narrower setting, until you rich thickness of approx 1 mm or position 6 on Marcato Atlas Pasta Machine. Return machine to original setting for each piece. Arrange ready sheet on a lightly floured work surface. Cut each sheet into 1.5x1.5 or 2x2 inch squares and let dry for 10-20 minutes. 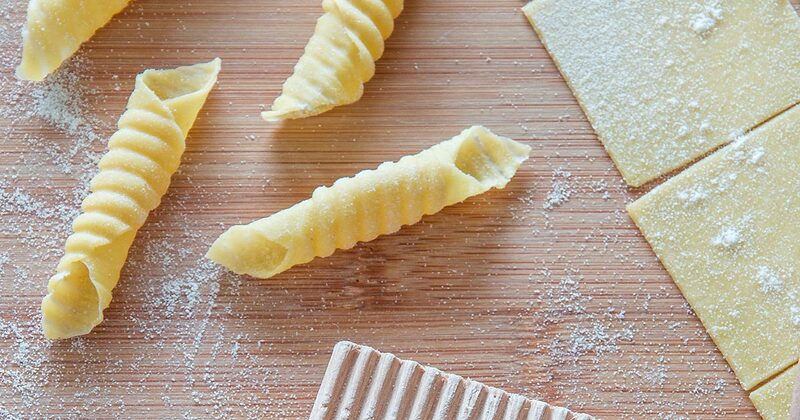 This will prevent garganelli from flattening when they’re ready. 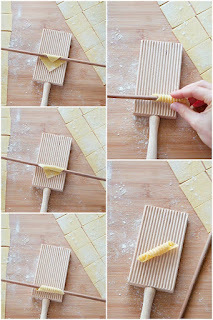 Place a pasta square on a well floured gnocchi board (gnocchi paddle). Fold a corner of the square over the garganelli pin. If you don’t have a special pin, try using a simple chopstick or even a round wooden pencil. Holding both ends of the pin roll it towards you. Apply pressure to imprint the ridges on the garganello and seal it at the same time. Be careful not to press too hard to avoid the dough sticking to the board but apply enough pressure to seal and imprint the ridges. Repeat the process with remaining squares and ultimately with the remaining dough.